Bookmans Entertainment Exchange (Hereinafter collectively referred to as “Sponsor”). 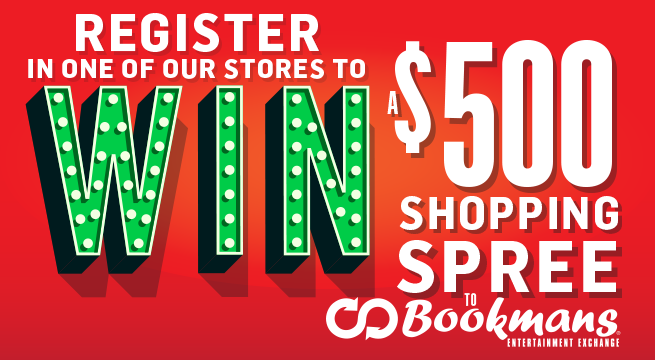 Entrants must be 18 years or older to enter the Bookmans $500 Shopping Spree Giveaway. Any individuals (including but not limited to current employees, independent contractors, vendors, and interns) and anyone previously employed by Bookmans Entertainment Exchange or their family members are not eligible to enter. “Family members” is defined as parents, siblings, step-parents, step-siblings, or spouses. “Household” is defined as any person residing at a shared residence with the entrant for at least three (3) months a year. The Bookmans $500 Shopping Spree Giveaway opens November 6, 2017, at 12:00 PM and closes December 9, 2017, at 11:59 PM. The final winner will be chosen on December 15, 2017. Entrants must sign up in person at any participating Bookmans Entertainment Exchange store in Arizona via the sign-up kiosk. Entrants must sign up for the Bookmans E-newsletter for contest registration. Duplicate emails will not be considered. Entrants will receive immediate confirmation of signup after signup completion. Bookmans does not sell or share emails with any third party vendor. Opt-out options for E-newsletter are available at any time after initial E-newsletter is received. Current E-newsletter subscribers are automatically entered into drawing. Winners will be notified via email address provided. Winners will be chosen randomly via a third party system. After an email has been selected as a winner it will no longer be considered for additional prizes in the Bookmans $500 Shopping Spree Giveaway. The first $500 Shopping Spree winner will be chosen on Friday, November 10, 2017. The second $500 Shopping Spree winner will be chosen on Friday, November 17, 2017. The third $500 Shopping Spree winner will be chosen on Friday, November 24, 2017. The fourth $500 Shopping Spree winner will be chosen on Friday, December 1, 2017. The fifth $500 Shopping Spree winner will be chosen on Friday, December 8, 2017. The sixth and final $500 Shopping Spree winner will be chosen on Friday, December 15, 2017. Should the winner be found to be ineligible for any reason (including non-compliance with contest regulations and rules or inability to claim prize during that time), an alternate winner will be selected at random. Odds of winning one of the six prizes is dependent on number of valid entries received. Winners of the Bookmans $500 Shopping Spree Giveaway are not entitled or eligible to redeem awarded Gift Cards for cash at any Bookmans Entertainment Exchange store or transfer their award to any other person(s) or entities. Winners must claim their $500 Bookmans Shopping Spree Gift Card no later than one (1) week from date of winner email is sent. Winner will receive their $500 Bookmans Shopping Spree Gift Card in person at their chosen Bookmans store. By participating in the Bookmans $500 Shopping Spree Giveaway, entrants agree to all rules and regulations as set by Bookmans Entertainment Exchange. Contest rules are the decision of the Sponsor and are final. Entrant participation in the Bookmans $500 Shopping Spree Giveaway releases Bookmans Entertainment Exchange (including but not limited to current employees, independent contractors, vendors, and interns) and any respective successors (“Released Parties”) from any claims, loss, or damage, arising directly or indirectly, from participation in the Bookmans $500 Shopping Spree Giveaway and/or prize acceptance and use. Entrant names, email addresses, and additional collected information will not be shared with any third party vendor or used without permission. By participating in the Bookmans $500 Shopping Spree Giveaway entrants agree to be placed on the Bookmans Entertainment Exchange mailing list for the Bookmans E-newsletter only. Entrants authorize Bookmans Entertainment Exchange and all Released Parties to retain all publicity rights for all contests and events including the Bookmans $500 Shopping Spree Giveaway. Participants may be photographed and/or videotaped for promotional purposes for use on the Bookmans Entertainment Exchange website(s) and social media platforms, worldwide in perpetuity. Sponsor is not obliged to use any aforementioned materials collected for promotional purposes, to be used at Sponsor’s discretion, but may opt do so without further obligation or compensation. To claim prize: winner must provide proof of age and identity with valid U.S. identification which includes a photograph. Acceptable identification includes one of the following: a driver’s license, state identification card, military identification card, or passport. Identify must be confirmed within the time period specified by Sponsor. Sponsor reserves the right to disqualify any entrant who interferes with the Bookmans $500 Shopping Spree Giveaway or entry process at Sponsor’s sole discretion. Sponsor reserves the right to modify, suspend, or restructure contest in the event of interference or other circumstances as deemed fit by Sponsor. Signed up for the email newsletter at my local store, but did not receive a confirmation email. The rules state a confirmation email would immediately be sent. So what should I do now? I definitely want to be entered for the drawing but do not want to be disqualified for entering more than once. Bookmans is a great place for adults and children of all ages. There is something for everyone and the price is just right. Take my grandkids there all the time. Theres always more to buy and not enough money to spend this family loves to read. This is first l heard of contest and l have been in Bookmans at least once every week last couple months…will go in person and ask – don’t see registration here..
Hello Thomas! Which location are you visiting? All Bookmans locations have a registration kiosk at the counter under a red sign. Any Bookmans employee should be able to show you exactly where it is so you can sign up on your next visit. Thank you for checking in with us! I would love to enter, but the closest Bookman’s is 2.5 hours away from me. We always visit when we are in PHX or Flag–is there any option or way to enter online? We love Bookman’s! Unfortunately, the contest requires in-store signup, but we hope that you can make it to one of the stores by Dec 15th to register. Thank you for supporting Bookmans and for making our stores a stop when you’re in town, Autumn! I’ve walked on there once with my son. Him and couldn’t believe the stuff you had and the prices. Some stuff I saw there, brought memories of my young days. Winning this shopping spree would be awesome for us two. That store is awesome. Been in their once with my son, we both liked the store from what we saw and prices on the stuff in store. Love love love! We toggle between the two Speedway stores to find a little something for everyone, kids love looking for their favorite books for bedtime reading, or book reports, my husband and his love for sci-fi books. I love treasure hunting for cool and unique knick knacks and kitchen miscellaneous and a variety of books.